I want to sell hosted email services. I want to purchase mailboxes for my business. I want to find an MDaemon Private Cloud provider. MDaemon Private Cloud email messaging software enables you to build and grow your hosting services the way you want. You Own the Customer Relationship. We're Just Here to Help. You set your own profit margins and you manage billing and support because you own the customer relationship. Our goal is to enable you to build a strong services business without a lot of complexity. We're not a big corporation. We're just like you: a small-to-medium business that has been serving other small-to-medium businesses around the world for nearly two decades. Unique Highjacked Account Detection minimizes the chance your customer's email is used to send spam. Expand service offering with low cost email and collaboration software. 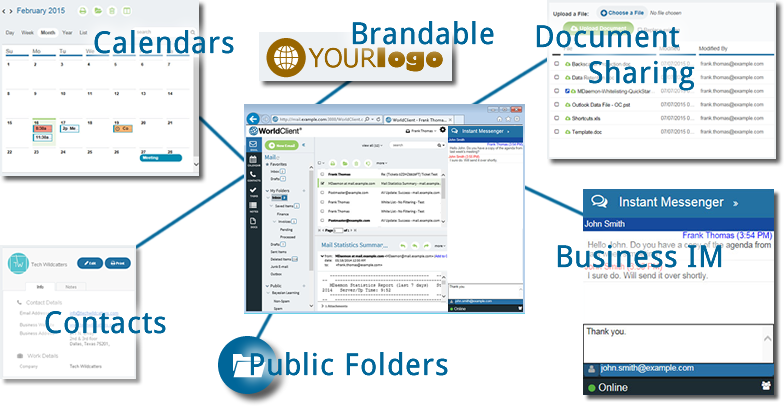 Customize web mail with individualized logos. Easy troubleshooting tools for rapid response and support. Solid reputation and trusted performance of email technology since 1996.